This is the third and final post of the series on managing your product management career. The first post was about assessing your product management skills and the second post was about how to market yourself as a software product manager. Now that you have assessed your skill set, build digital assets for your personal brand, you are now ready to start the next step in your career. Here are a few job hunting tips. If you think that you can easily find a job by posting your resume on as many job sites such as Monster, Careerbuilder or HotJobs, be prepared for a rude awakening. I have never posted my resumes on any job site. The only professional resumes you can find on me are on LinkedIn and on the About me page on this blog. There is something called a “hidden job market” out there which is a lot larger than the “visible job market”. Various studies have indicated that upto 80% of new jobs that get filled are never advertised. They get filled via referrals. So if you are dependent on applying for advertised positions and waiting for the phone to ring, you are going to be disappointed. If the above number does not awaken you, consider this one. About 24% of jobs are created when an exceptional candidate is found – wow, these jobs did not even exist before the employer found this candidate. (Source: mgssearch.net). So how do you really tap into this hidden job market? A google search will point you to a very good articles on how to do this. Here are three tips that I have put to work in my past job searches. 1) Work your network! Let the network know that you are looking and seek their help in getting in touch with decision makers in companies that you may want to work for. This can be done confidentially if you let your network know. 2) Attend local product management or industry related events (breakfasts, dinners etc.) – You are likely to run into hiring managers or potential job seekers that you could look to hire. For example, when I attend the Boston Product Management Association meetings, I always hear hiring managers announce that they are looking for product managers. Such events give you the golden opportunity to meet face-to-face with the hiring manager without having to send emails, play phone tags etc. You could not find a better way to get in the door. After this, it is upto you to make a great first impression that will result in continued engagement and hopefully a job offer. Remember that you are always a salesman for a product – YOU! 3) Continue to expand your network even during job searching. I have written about how to do this in my previous post on how to survive a layoff. 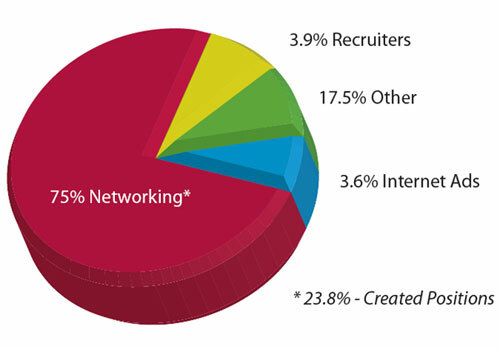 4) Always network – don’t wait till you are ready to look for a job. They say “Dig Your Well Before You’re Thirsty” . Thoughts? Do you have any additional ways you have used to look for jobs that have worked successfully? If you enjoyed this post, please tell your network know about this blog, consider leaving a comment or subscribing to the feed to receive future articles delivered to your feed reader or by subscribing by email via the text box in the column on the right. Excellent blog spot. Lots of good information. Now-a-days every people likes to do managers job..